Actor and aikido black belt Seagal, the first foreigner to operate a aikodo dojo in Japan, is known for his 90s films, “Hard to Kill,” “Marked for Death,” and “Out for Justice.” He allegedly got his first role in a Hollywood film after putting on an aikido demonstration for the Warner brothers. 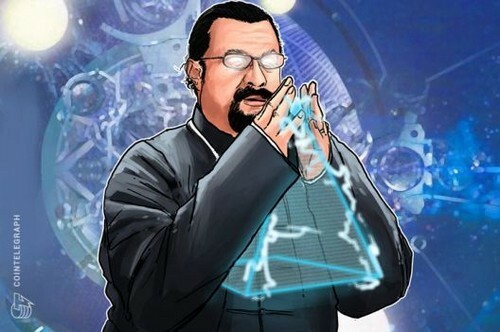 Seagal tweeted his involvement in the new cryptocurrency only yesterday, Feb. 20, which coincided with the release of another Bitcoiin2Gen press release on “clarify[ing] allegations” made by Coindesk, TNW, CNET, Mashable, Business Insider, and Fortune that accused the cryptocurrency of being a pyramid scheme, scam, and MLM company. In an attempt to dispel fears of any association they might have with a pyramid scheme, Bitcoiin2Gen responded to the media’s allegations by elaborating that their four level pyramid-like commission structure, where potential investors can earn money by promoting B2G by word of mouth, will only exist during the Initial Coin Offering (ICO). The B2G ICO was launched in January 2018 and the official launch of the cryptocurrency is scheduled for March, 2018. The B2G white paper reveal predictions for the coin’s price to hit $388 per coin by December. Although Bitcoiin2Gen admits that Seagal’s endorsement has brought them popularity, the company also insists “most assuredly Bitcoiin2Gen’s being self-sufficient coin is the only reason enthusiasts are participating in ICO or becoming part of the Bitcoiin2Gen”. Damnit Steven I was just about to Tweet you to warn you that someone was using your name and likeness to promote some Shitcoin without you knowing, and here we are. Dump this and run! Quick before you become the next Bitconnect Carlos!